Some of the best known and popular cozy mystery writers to date are Joanne Fluke, Diane Mott Davidson, Agatha Christie and Rhys Bowen. These are just a few to name, but there really is a plethora of them out there. The other thing that cozies are known for is focusing their themes around certain holidays and cooking. Some of the holiday titles are Mulled Murder, The Gingerbread Bump-Off, Death of a Turkey, and The Chocolate Cupid Killings. Again, you can see the humour that is injected in to the title of the novels. To get your fill of mystery solving and mouth watering delicacies you can try Rosemary and Crime or Death by Chocolate Lab. 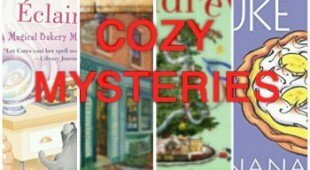 What’s really great about a lot of cozy mysteries is that they are written as a series, so you can get to know and love the characters involved. I know for me personally, some of the best books I’ve ever read were parts of series because there are certain literary characters I’ve become really attached to (ie. Elena and Lila from the Neapolitan Novels, or any of the brawny vampires from the Black Dagger Brotherhood, though these aren’t cozy by any means). Hannah Swensen from Joanne Fluke’s series, Precious Ramotswe from the No. 1 Ladies’ Detective Agency, and Alan Bradley’s Flavia de Luce are some cozy mystery stars. Have I convinced you enough to try one of these likeable and easy mysteries? I think it is the perfect time of year to warm up to a cozy mystery, with a big comfy blanket and a steeping hot cup of tea! For more searching and cozy mystery shopping around please feel free to visit WPL’s catalogue.